But when can we do it on our phones? Mastercard has agreed a deal with Transport for London to stop you wasting money on travel. 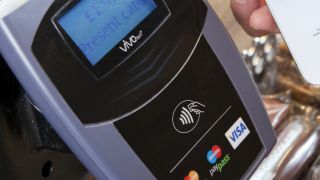 From today commuters can pay for their bus travel using a PayPass bank card, which will cost considerably less than paying for the same trip with cash. Buses across the capital are already equipped with the contactless readers for Oyster Card payments, but this move means travellers won't have to have a topped up travelcard prior to boarding the bus. Given it's going to be an eye-watering £2.40 to pay by cash for any journey in 2013, compared to the £1.40 if using an Oyster PAYG card, the fact PayPass bank cards will mirror the lower charges will be a godsend to those who travel the bus infrequently but like the idea of paying a pound less. The balance is taken straight from their bank account instead of needing to queue in a newsagent to top up an Oyster card first. And there's also the extra bonus of not being stared at angrily by the bus driver when you try to pay for a jaunt to the shops with a £20. They don't like that, trust us. Similar schemes are planned nationwide, and the likelihood is that the technology, which is already present in phones, will be added to the roster of bus payment mechanisms in the near future – we're chasing Mastercard for an answer on this at the moment.